Where: Heathrow Airport, London, UK. Long story short: Futuristic short-stay pod. A midnight check-in to a tiny room that you’re planning to leave four hours later? The Yotel has been in business for some years now, and in fact if you feel so inclined, you can go to YouTube and watch a young me do one of his first video reports, bouncing around one of the executive cabins like a travel Alan Partridge. Anyway. For those that don’t know, the Yotel is a hotel in Terminal Four of Heathrow Airport. You can rent rooms for as short a time period as four hours, so perfect for layovers where you need to catch a bit of kip that isn’t in the blaring noise-fest and aggro-park of the passenger lounge. It’s the utility that appeals to me. Singles can book a standard cabin, couples a premium one, both come with comfy beds (the standard more of a bunk, but still comfy), rain showers, free internet, mood lighting and the feeling that you’re bedding down on the space shuttle or a futuristic ocean liner. There’s a reassuring silence, with sound insulation as well as calming colours and a kind of sci-fi cosiness – if Apple did hotels, this is basically what they would look like. In other words, it's like staying in an iPod. In a good way. For longer stays, other options come into play – a fold out desk to catch up on emails, free hot drinks at the galley (also the check in, though there’s also normally an automated check-in to complete the undeniably modern experience). I will say this. Claustrophobics are not going to like these cabins. The standard ones are pretty small, but for the nature of what they’re designed for, this is something I love about them. You feel ensconced, away from the madness of the terminal. I arrived during a near-riot as Terminal Four hit a breaking point of transit chaos, and so the oasis-like charm of the Yotel was even more pronounced. They don’t skimp on add-ons. The free wifi is fast and reliable. You get towels and soap. In short, they aren’t trying to stiff you on essentials. The menu is basic, and not super healthy, but it’s OK, and you can go and forage in the arrivals lounge for what that’s worth. There’s a pub right outside serving…pub food. Enjoy an overpriced Full English breakfast with a pint at 8am. Hell, you’re on holiday. Being right in the terminal is a happy bonus. You can be taking a shower within 20 minutes of landing. You can pay up to £50 just to get into passenger lounges you can’t sleep overnight at, so suddenly a bed for possibly less money looks pretty good. Also, you’re not schlepping around on a bus to get to some satellite “airport” hotel that turns out to be not that close and oh suddenly you have to get a taxi, didn't we mention that on our website? Yeah, I’ve had that before. Oh, my room is a five-minute walk from passport control? Sign me the flip up. 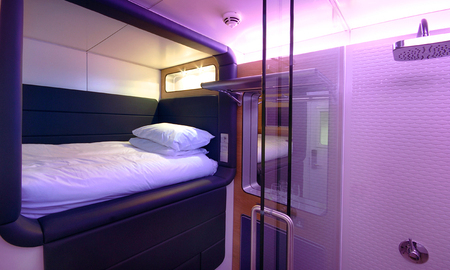 For me, the kind of utility-chic cabins with their sensory isolation that the Yotel offers are ideal. They’re just what I want between flights, actually. I’ve even rented them as a sort of personal arrivals lounge, somewhere to decompress for four hours while I avoid the London rush hour and lay low until I can head into town at a more leisurely pace, refreshed and with a lower pulse rate. Yotel, I’m a fan. I know you’re not for everyone, but you’re definitely for me. Champagne tastes: Go crazy with a premium cabin. At off-peak times, they are just £55 for four hours. Shandy Pockets: Standard pods start at £35 for four hours.